Congrats on the GDT!! These are GORGEOUS! LOVING those ADORABLE reindeer!!!!!!!!!!!!!!!!!!!!!!! Oooh...super pair! Great colors. Cute reindeer...awesome! Happy Holidays! These are so super ADORABLE Sherrie!! Congrats on your Guest Designer spot!! LOVE LOVE LOVE your projects!!!!! Congrats on your GD spot Sherrie! So well deserved! Your cards are so sweet! Those little reindeer are darling and I love your mix of patterned papers! Adorable! I love that reindeer stamp. Oh that little deer is so cute! Hope all is well with you! These are so sweet! Love that little deer. Congrats on yous GD spot over at JB. The deer is just precious!! Adorable cards and Tags!! Super fun treats! Congrats on you GD spot. You sure made some cute cards and tags. The reindeer is adorable. Love the papers and design. Well done my friend. Oh Sherrie these are so cute!! I love the colors you used on them! congrats on being a guest designer!! You are awesome! These are just darling Sherrie!! I love the two different color combos!! Congrats on being a guest designer, I will be one on the 16th!! Very sweet projects! I love the coordinating tags and cards! The little reindeer is so adorable! Congrats on the guest designer spot! I just adore that Deer Stamp! Your projects look wonderful Sherrie! They're so CUTE! Congrats on the GD Spot! Huge congrats, and these are Soooo cute! Love them! Can nt even say how cute these are...adorable. Thanks for playing with our tic-tac-toe challenge at Die Cuttin' Divas this week. These are so sweet and pretty ! That deer is adorable ! Lovely and wonderful creations ! Oh my goodness, it just doesn't get any sweeter! 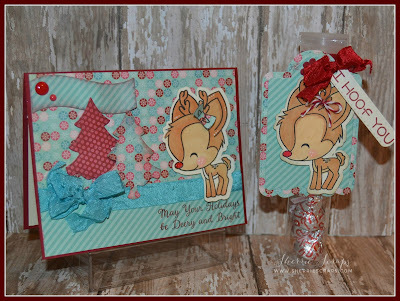 I love that darling little deer, Your papers are so soft and pretty and the layout is perfect - beautiful work my friend! Love the paper and colour combination. Absolutely adorable set! Thanks for joining us at DieCuttinDivas this week. Super cute cards and tags!!! The reindeer is adorable!!! Great colors too my friend! 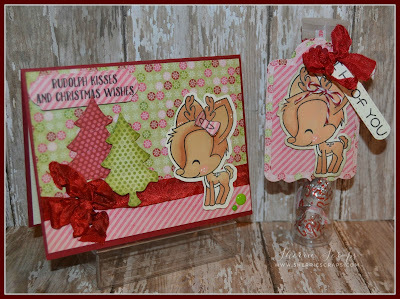 What a adorable cards and tags, Sherrie!! Love the pretty papers and colors you used!! Congrats on you GD Spot!! Have a great day.